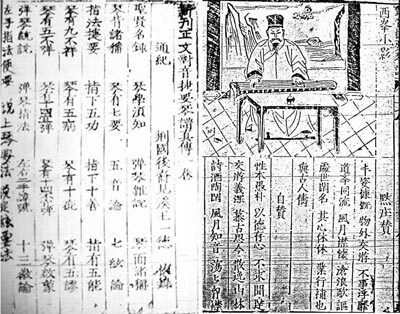 This earlier version of Yang Biaozheng's Chongxiu Zhenchuan Qinpu (1585) was also published in Nanjing. 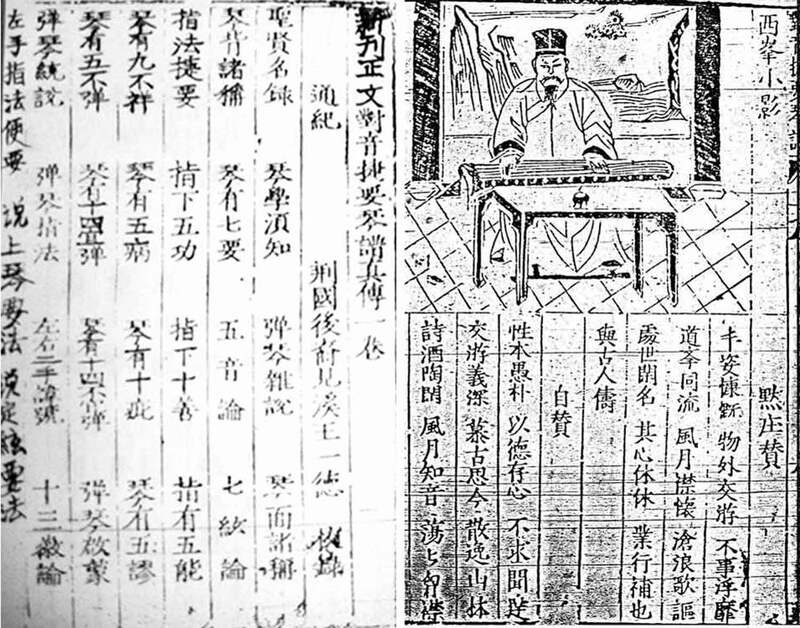 Its six folios include three "tiao xian" exercises not mentioned in its original table of contents, plus 65 further melodies, all with lyrics. Nine of these melodies seem to have their earliest publication here. Of the 68 entries only Shi Yin seems not to be in 1585. In fact, though, its melody is used for the Xing Tan Yin of both 1573 and 1585. In addition, many of the other melodies have differences with the same titles as published in 1585 (see comment). Records generally refer to the edition of this handbook kept in the National Library, Taiwan, where it is available on microfilm. However, there is at least one more surviving copy of this handbook, perhaps also in Taiwan, and available online. No copies of any 1573 edition seem to have been re-published on the mainland. 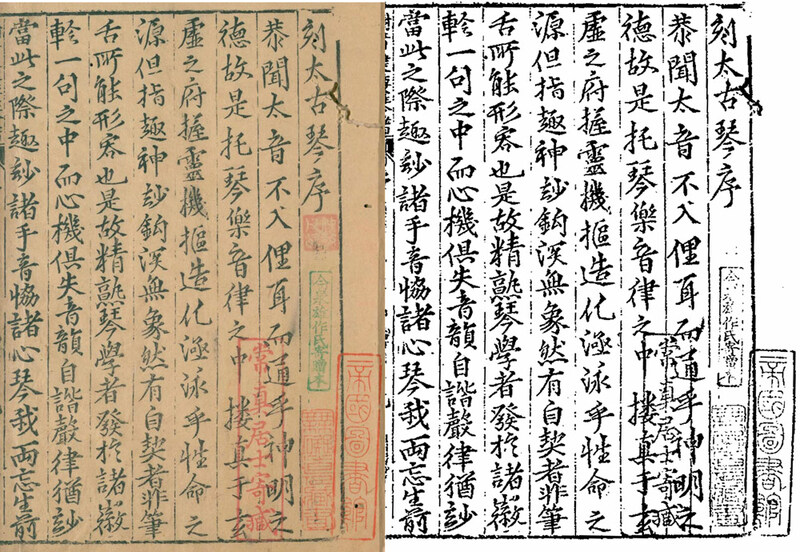 For example, this first page from the online edition (the image also shows the microfilm version for comparison) has seals on the lower right side, but there are no such seals on the respective pages of National Library's microfilm copy (reproduced here in the upper image, right half). 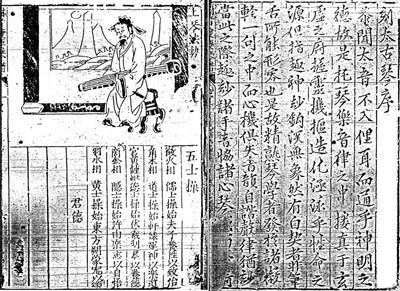 In addition, the online edition does not have either of the illustrations of Yang Biaozheng shown here at right. The differences of these from the later version(s) are such that it is necessary to have this separate entry for the 1573 edition. However, the similarities are such that most of the commentary is included under the 1585 edition. As of yet I have re-constructed only a few melodies from either edition of this handbook. A primary reason is that my focus is the music, not essays, and there are problems interpreting the melodies. In the first place there seem to be a number of unexplained finger techniques in the tablature, plus quite a few errors in both editions. In addition, all the melodies have lyrics but many of these do not easily lend themselves to singing. See listing in the National Archives, Taiwan. The original images here came from an incomplete photocopy I made some years ago. 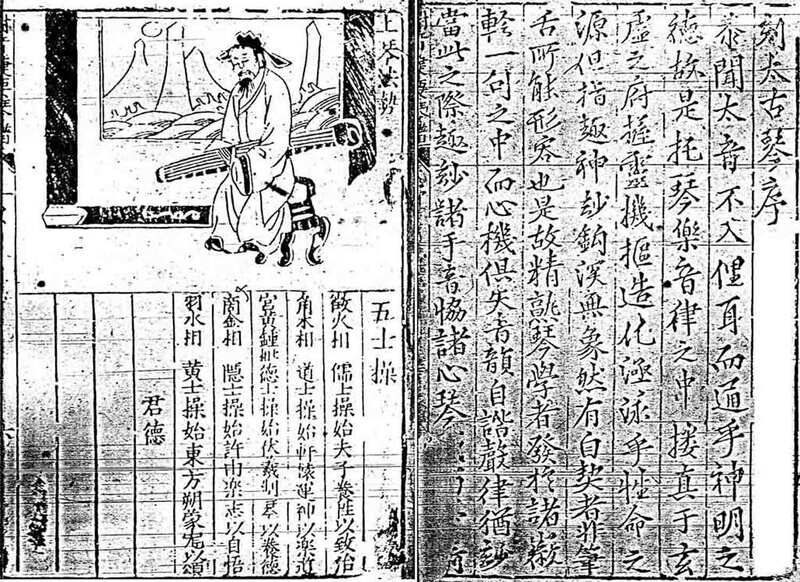 From microfilm of the Taiwan edition; neither image of Yang is in this facsimile edition. I have downloaded one such copy.